Rejoice! 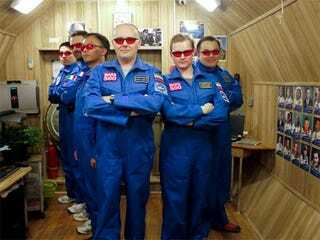 Six fake astronauts near the end of their simulated Mars mission, and will set foot on Earth, which they will pretend is Mars. It's the closest a human will get to the real thing for a very long time. The journey will ultimately take 520 days, during which time these international pseudo-nauts will have been subjected to all manner of Mars voyage-related experiments, "mishaps" and just 52 showers each in their 1,800-square-foot vessel. Mishaps is in quotes because every catastrophe or challenge was created by engineers monitoring the fake astronauts from the outside. We didn't know how long it would take for the engineers' team to solve the problem. So, to save some power on the emergency batteries and to avoid any new issues, we unplugged all the electric devices and we even removed the bulb of some security lamps which weren't needed. In the end only two lights remained: one in the kitchen and one near the bathroom. To their credit, these six men did not eat the weakest of their number when disaster struck, nor did they panic and open the fake airlocks when all seemed lost, as it did when they were pooping and showering and eating in near darkness during that harrowing power outage. With only 10,000 fake miles to go before reaching Mars orbit, the journey is nearly done. Final touchdown takes place in November. Dammit, they survived, and we could all learn a fake thing or two from their journey into the vast unknown blackness known as "Moscow." Rejoice!